Our packages all start and end at Alder Bay on Vancouver Island. Alder Bay is 15 km south of Port McNeill or 190 km north of Campbell River on Vancouver Island. For those driving, watch for the signs to Telegraph Cove, turning off the main Highway 19 onto Beaver Cove Road. From the Highway 19 turn off, it is approximately 6 km to Alder Bay. For driving directions and driving times please see the Google Maps link for Alder Bay. 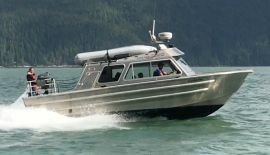 From Alder Bay, we transport our guests in and out of Farewell Harbour Lodge via our high speed water taxi. The journey takes us into the heart of the Broughton Archipelago past some of the most bio-diverse marine habitat on the planet. We often get side-tracked on our journey in to the lodge by feeding Humpback Whales, curious Stellar Sea Lions, or playful Pacific White Sided Dolphins! Incoming guests depart Alder Bay at 12 noon daily arriving at Farewell Harbour at 1230pm. Outgoing guests depart Farewell Harbour at 11am daily arriving back at Alder Bay at 1130. On arrival in Alder Bay, guests should check in at the Farewell Harbour Lodge Reception Trailer. Complementary parking is available for Farewell Harbour Lodge guests. Guests can obtain a parking pass from our Reception Trailer. 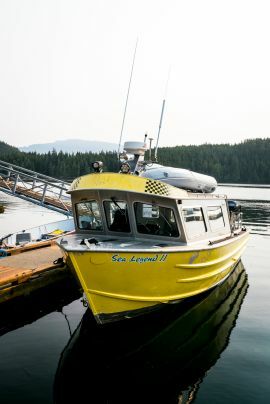 For the water taxi shuttle departing Alder Bay, guests must check in at least 30 minutes prior to the scheduled departure time. There is no restriction on baggage weight however guests may leave excess baggage in our secure storage. Our complementary hotel and airport shuttle offers pick up at Port Hardy Airport meeting the first Pacific Coastal flight of the day from Vancouver every day. Pick ups from local hotels in Port Hardy is between 930am and 1030am daily. Please contact us if you require a shuttle to or from the Port Hardy Airport or local hotels.